We all dream of a beautiful garden and a manicured property. To achieve it, one of the things to consider is pruning the hedges and shrubs regularly. Some homeowners believe that using a saw or the shears might do the job, but an electric hedge trimmer might be more appropriate. In fact, the best way to trim the hedges and take care of your property is with the help of an electric hedge trimmer. But how to choose the best model on the market? And why choose electric after all? 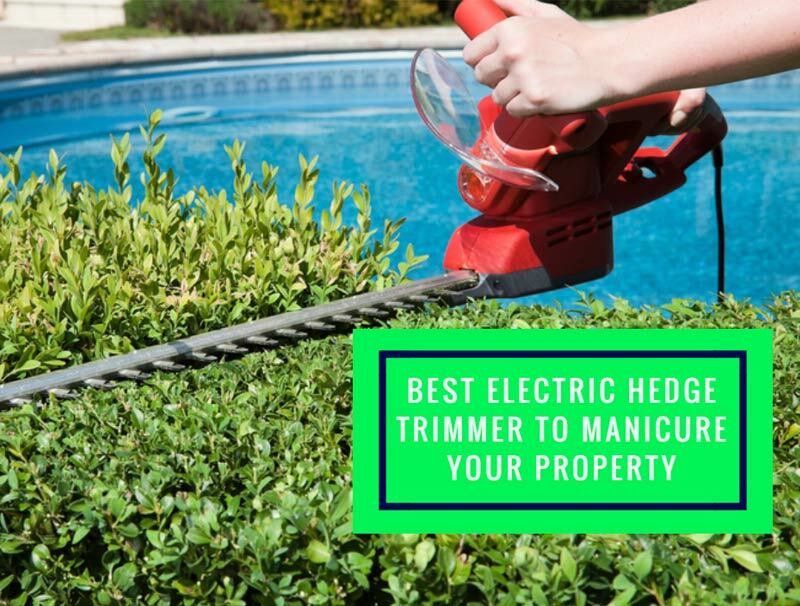 Read our guide to find out or click on the links below to discover the best electric hedge trimmers on the market. 1. BLACK+DECKER HT22 Hedge Trimmer, 22"
On the market, there are two types of hedge trimmers, gas-powered and electric. The electric models can be subsequently divided into corded and cordless, but in this guide, we’re going to focus on the corded type. Choosing an electric trimmer over a gas-powered one is often a matter of preference, but there are other things you should consider. The most important is the morphology of your garden and of the hedges you have to prune. Electric hedge trimmers are ideal for small or medium-sized properties. They are powered by a regular cord, therefore you’ll have limited freedom of movement. Moreover, these hedge trimmers might not be suitable for those who have many fixed obstacles in the yard, such as trees or flowerbeds. Gas-powered hedge trimmers are powerful and easy to use regardless of the size of your property. They are powered by a 2 or 4-stroke engine and can run indeterminately as long as they have fuel. However, they are heavier, harder to maneuver, noisy and polluting. Electric hedge trimmers are probably the best option for those residential consumers who, for one reason or another, don’t want to invest in a cordless power tool. The only thing to pay attention to is the cord and make sure it’s long enough and that it’s kept away from the blades. Gas-powered hedge trimmers are more suitable for the professional landscapers and gardeners who use the tool to make a living. Weight is the first thing to consider when buying a hedge trimmer. Electric hedge trimmers are usually lightweight and most of the times their weight doesn’t exceed two or three pounds. Remember that heavier models may not be suitable for the elderly or for the women who are not accustomed to handling this type of tool. You should consider the grip of the model and its ergonomics. The handle should be covered with a non-slip layer. The length of the blade, on the other hand, should be suitable for the type of hedges you have. If they are tall, choose a trimmer with a long blade or with telescopic handle. Ideally, you should be able to trim the hedges without the need of a ladder. Not all electric hedge trimmers are the same. The motors have different powers and it is advisable to choose the most powerful model that fits your needs. This will save you time and help you make precision cuts whenever needed. Electric hedge trimmers are usually quiet but make sure you check the noise level before buying. Some residential areas have strict noise regulations and you might want to comply with them. Lastly, choose a tool that features a great safety system. The blade should be equipped with a metal protector that keeps the blade away from walls or metal fences. The motor should stop automatically in the case of an impact, to protect the gardener. The BLACK+DECKER HT22 Hedge Trimmer, 22" is one of the most popular electric hedge trimmers for residential use thanks to its cutting performance, maneuverability, and ease of use. The main feature of this power tool is the dual action blade. The tool is equipped with two blades that trim and prune the hedges faster and cleaner, with less effort from the gardener. Moreover, the blades are multidirectional, helping you trim the hedges with greater precision. Blades: the steel blades are sharp and made to stay sharp for a really long time. You’ll not have to worry about losing cutting precision. Rust resistant: the blades are rust resistant and you’ll find them in the perfect state every time you need to trim the shrubs or hedges. BLACK+DECKER has always been a symbol of reliability, so there is no wonder why another BLACK+DECKER electric hedge trimmer is the second most popular on the market. The HT20 3.8-Amp Hedge Trimmer is powered by a 3,8 amp motor and it is ideal for all homeowners. The tool is equipped with a dual-action blade similar to the one described above. Thanks to this feature, the hedge trimmer is able to perform its tasks effortlessly and in no-time. The blades are made of hardened and rust-resistant steel designed to stay sharp for a long time. To add up to the convenience is the lightweight and compact design conceived to reduce fatigue and improve the user experience. Last but not least, the full wrap-around front handle provides a comfortable grip in all cutting orientation. The tool is ideal for the short and medium-height shrubs and hedges. Dual blades: this tool is designed to help you finish hedge trimming in no-time thanks to the dual blades system. Compact: easy to hold and maneuver, the tool has a lightweight design that will allow you to use the tool with less fatigue. Maneuverability: the full wrap-around handle is designed to provide a comfortable gripping area in all cutting orientations. Steel blades: the hardened steel blades are coated with an anti-rust layer and will stay sharp for a long time. The blades sometimes rip the branches instead of cutting them neatly. The GARCARE 4.8A Multi-Angle Corded 2 in 1 Pole and Portable Hedge Trimmer is a reliable and powerful tool designed to help you trim the hedges and maintain your property neat and tidy at all times. The tool has a dual function of the pole and portable hedge trimmer and it is powered by a powerful 4.8 amps motor. The pole hedge trimmer extends to over 9 feet long and allows you to maintain the aspect of the taller hedges and shrubs. Thanks to this feature, you’ll not need a ladder to reach the highest spots. Apart from the telescopic tube, the tool also features a pivoting head that allows you to trim the hedges at a wide variety of angles. To all this, add the soft rubber grip handle that absorbs vibrations and increases the comfort during usage to create an almost perfect tool to use in your garden or yard. 2-in-1 pole design: this electric hedge trimmer was built to address a wide range of trimming chores. The pole has a standard length of 7.4 feet and it extends to 9 feet. Laser cutting blade: the anti-rust hardened steel blade will stay sharp for a long time and provide clean and quick cutting. Pivoting head: the tool has a 6-position pivoting head that allows you to trim at a variety of angles. Comfortable: the tool has a great maneuverability and soft rubber grips that absorb the vibration and increase the comfort during use. The cord doesn’t comply with all the safety standards. For shorter shrubs and hedges, the Greenworks 18-Inch 2.7 Amp Corded Hedge Trimmer 22102 might be the perfect tool. This electric hedge trimmer is powered by a 2.7 amps motor and it features an 18-inch dual action steel blade that cuts the branches effortlessly. The tool has a 3/8-inch cutting capacity and is ideal for short bushes and shrubs. With the compact dimension also comes an improved maneuverability and the tool is easy to handle by all homeowners. Moreover, it is a great tool for the inexperienced gardeners. Regarding the safety features, this power tool has a convenient cord lock features designed to prevent accidental unplugging. The tool is backed up by a limited 4-years warranty. Dual action blade: this electric hedge trimmer has an 18-inch dual action steel blade that delivers an optimal performance and maneuverability. Lightweight design: the tool is easy to handle and requires little fatigue even for the most demanding chores. Cord lock: the electric hedge trimmer features a convenient cord lock that prevents accidental unplugging. Cutting capacity: this power tool is designed to trim the hedges and manicure the bushes in your yard fast and effortlessly thanks to the 3/8-inch cutting capacity. The motor is not really powerful and the tool might not handle well the heavy-duty jobs. Designed for residential use, the Makita UH6570 25" Electric Hedge Trimmer combines the commercial-duty power with an incredible ease-of-use to improve performance and boost maneuverability in a wide range of applications. The tool is powered by a 4.6 AMP motor that delivers 1,600 SPM for faster trimming and is engineered for quiet operation and less vibration. Apart from these important characteristics, this power tool also has a high cutting capacity and delivers an increased efficiency. Inspired by the commercial power tools, the Makita electric hedge trimmer boasts a two-hand operation switch that increases the safety. This means that the motor runs only when the grips are held with both hands, preventing in this way accidental injury. In addition to this, to increase safety, the power tool also has a large transparent hand guard that improves the view in the working area and a well-balanced design ideal for both passionate gardeners and enthusiast beginners. Maneuverability: this power tool boasts a large cutting capacity and a well-balanced design. It weighs less than 9 pounds and it is easy to handle. Safety: this electric hedge trimmer has a two-hand operation switch and the motor runs only when both grips are held with both hands. Transparent guard: designed to maximize the view in the work area, this power tool is equipped with a large, transparent hand guard. Noise level: in addition to low vibrations, this tool also features a low noise level. It is ideal for residential use in almost all areas. Although it weighs less than 9 pounds, this electric hedge trimmer is pretty heavy compared to the competitors. Although heavier than its competitors, the Makita UH6570 25" Electric Hedge Trimmer is still probably the best on the market. This electric hedge trimmer is powered by a 4.6 amps motor and delivers commercial-duty power for the residential users. The trimmer has a powerful dual blade designed to stay sharp for a long time. Moreover, the tool is engineered for quiet operation and reduced level of vibrations. This increases the level of comfort in terms of both maneuverability and convenience. Thanks to the low level of noise, the tool complies with all regulations while the low level of vibrations will allow you to use the tool for a longer time in a single session. Regarding safety, the tool requires a two-hand operation and it comes with a transparent hand guard. Apart from this, the electric hedge trimmer delivers a high cutting capacity and an increased efficiency. Last but not least, this electric hedge trimmer is backed up by a limited 1-year warranty and it comes with a 30-day satisfaction guarantee. In other words, if you’re not fully satisfied with the product, simply return it and claim a full refund or replacement. What else could you wish for?